Word just came in — the deal is official. eBay (s EBAY) is selling Skype in a deal that values the Internet calling service at $2.75 billion. eBay will get $1.9 billion in cash, a $125 million note, and will give up 65 percent of the company to the buying consortium led by Silver Lake that includes Index Ventures, Andreessen Horowitz and the Canada Pension Plan (CPP) Investment Board. eBay gets to keep 35 percent of Skype. The transaction, which is not subject to a financing condition, is expected to close in the fourth quarter of 2009. And it looks like the current CEO, Josh Silverman, is going to keep running the service, which is actually good news. Skype generated 43.4 billion minutes of free, Skype-to-Skype (computer-to-computer) traffic in 2007 and 65.5 billion minutes in 2008. Skype users generated approximately 4.2 billion minutes of paid international traffic in 2008. Skype also reported 5.6 billion minutes of paid, computer-to-telephone traffic in 2007, and 8.4 billion minutes in 2008. TeleGeography estimates that approximately 33 billion minutes of Skype’s computer-to-computer traffic was international, up from 22 billion minutes in 2007. Skype is the largest provider of cross-border voice communications in the world. So Donahue gets to say that he got the higher valuation of Skype, got rid of a potential legal nightmare and can get any upside that comes with the initial public offering of the stock. Seems like a win-win, but that IPO — don’t count on it. To be honest, this deal makes much more sense compared to all the rumors that were floating around earlier. If you think about it, what Donahoe just did was follow the golden rule of business: If you’ve got a problem, make it someone else’s problem. And the problem for the new buyers is that the legal issues of Skype are not going away. Some of my smart friends think that Skype can sidestep these problems by switching to a SIP-based infrastructure, but I won’t hold my breath. Any SIP-based infrastructure would sharply increase the need for building a massive global infrastructure. It would also mean working with partners (that make Skype devices) to re-configure their products and getting 400 million-plus users to switch to a massive new model. In other words — like skating in the middle of a semi-frozen lake underneath a brightly shining sun. So the new investor group will have no option but to settle with Niklas Zennstrom and Janus Friis if they want to use the new technology. For a nice piece of Skype, the duo would settle. And they will win again. Not that there’s anything wrong with that. Photo courtesy of Casey Serin via Flickr through the good work of Phil Wolff. Great now we have to pay if we want unlimited calls. Skype is a sell out. It never made sense to me why eBay bought ebay. Occasionally I buy stuff from ebay. I would never want to call a buyer. Email works fine. Most people have cell phones with free long distance. Why would I use Skype to call? Unless the argument was to conceal the sellers’ phone numbers and use Sjype handles instead. In this economy, it seems eBay recouped its investement and fended off a legal headache. Now it can concentrate on the auction site and move on. Ebay has got to be getting the short end of the stick in this deal whilst it’s a great deal for the new Skype investors….. I can only see upside in this deal…. Couldn’t agree more that Josh Silverman has done a brilliant job in building out Skype t and think he is clearly the man to continue running with it and delivering on the opportunity. The executive team should now really get the full commitment and resources to grow this puppy. Which for all skype fans is a great thing. Though I still wonder where ebay is going with all of this? As a platform and community haven’t they maxed out? Paypal is where a strong part of their future growth will come from and to me Skype was the other pillar of growth…. I am an ebay shareholder exactly because of these 2 growth stories….. if they spin off paypal I hope its to the public market where I can buy some shares…. 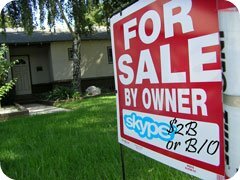 btw I’m sure there are alot of details and legal complications with this idea but wouldn’t it have been great to sell shares in Skype on ebay? I’d put in a lot of bids and I bet you I’m not the only one. I actually waited for someone to come out and say that Skype won’t switch to SIP as it makes to business sense to them – thanks for doing that! Skype is subpar in the mobile app area. If they can build a great app ( they have for iPhone and WinMo and such)., which focuses on the sound quality , they have a life under the new management. Current call quality is horrible ( the terrible ECHO anybody :-) ). Else ,they are gone. I am not sure the former Netscape guy can make a profitable business out of it. Comcast, Verizon, Time Warner and Vonage are fighting out in this low margins business. And there is this small matter of MagicJack . VOIP consolidation will take place in next three years. Great news! Josh has done a wonderful job at Skype. He will hopefully now have the resources and the freedom to go it even bigger and better.